I tried a bread machine for awhile and gave up. I love crusty loaves, but didn’t love paying 3-5$ at the grocery store or bakery. If you like bread, the book, or a fresh loaf is a great idea for a Holiday gift. Yummy! (We’ve baked about 3 loaves a week for the last 2 months.) M likes it for breakfast. It’s also an easy part oaf a snack. (I put butter on and wrap it up and bring some fruit and water and it’s a good snack on the go.) I also recommend visiting their website and watching their video on the technique. It’s really helpful. Next post will be a musing on internal regulation and mindful eating. Long and short is when I first started baking the bread I ate lots of it and enjoyed it. Stay tuned. thanks Suzanne, and welcome to the blog! I had a weird thing happen with my breadstone. Started smelling up the whole kitchen with a distinctly VOC smell. I had to throw it out. I find that doing it on my fancy cookie sheet (an air pocket thing…) seems to work fine. What have you found? I will post soon an update on my foray into baking! I have this book too! I didn;t know about the "healthy bread" book I will look for it next! Love it. I calculate that even using organic flours that I spend less than a dollar to make my own bread. As to what your father said, its a known fact that a slower colder rise gives you better tasting breads. 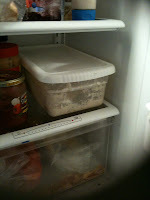 Aside from the "starter" it is one of the things that gives sourdough its lovely flavor. 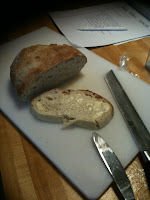 If you like baking, may I recommend the "A Year in Bread" blog? It is a wonderful resource and they have GREAT bread pictures. They have a new book called Healthy Bread in 5 Minutes a Day that has whole grain recipes. I haven't read it but it sounds promising.